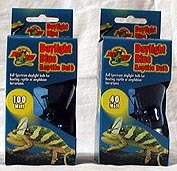 Full Spectrum daylight bulb for heating reptile or amphibian terrariums. Provides UVA - the wavelength that stimulates normal feeding behavior in reptiles. Uncoated Blue Glass for better heat transfer.